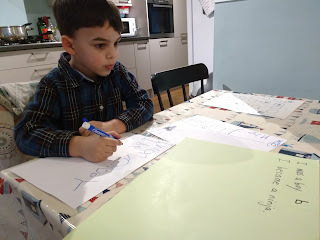 It is just a month ago that I wrote about my youngest son (aged 4) beginning to write - and I documented his zigzag patterns and maps in this post. In just a month, these zigzags have turned into numbers, letters, words ... even stories. Back in the summer, he would trace his zigzags and tell me a story he had made up, as if reading his own writing. Later, he dictated stories for me to write down for him in his own words. These pages were carefully laminated, and kept (treasured) under his pillow. 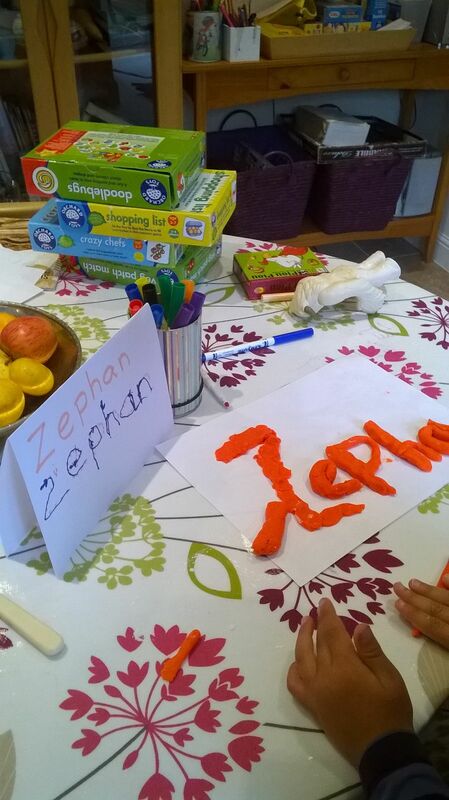 My Mum has encouraged him to make the letters of his name with playdough. 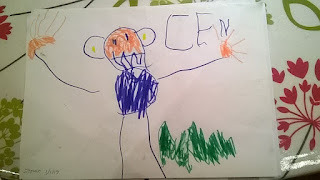 But at home there had been no great interest in writing his name. He would sign cards for people with a Z (sometimes back to front). 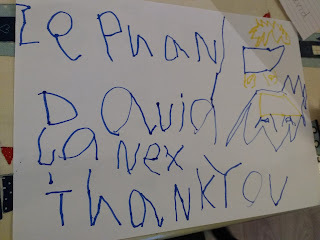 Then, suddenly, in my Mum's birthday card, he wrote his whole name ... rather higgledy piggledy ... but all the letters there - and with little help given. That was early January. Then it was time for Christmas thank you letters. I suggested he might draw a nice picture and put his name on? No, he was going to write his own letters. Fair enough. 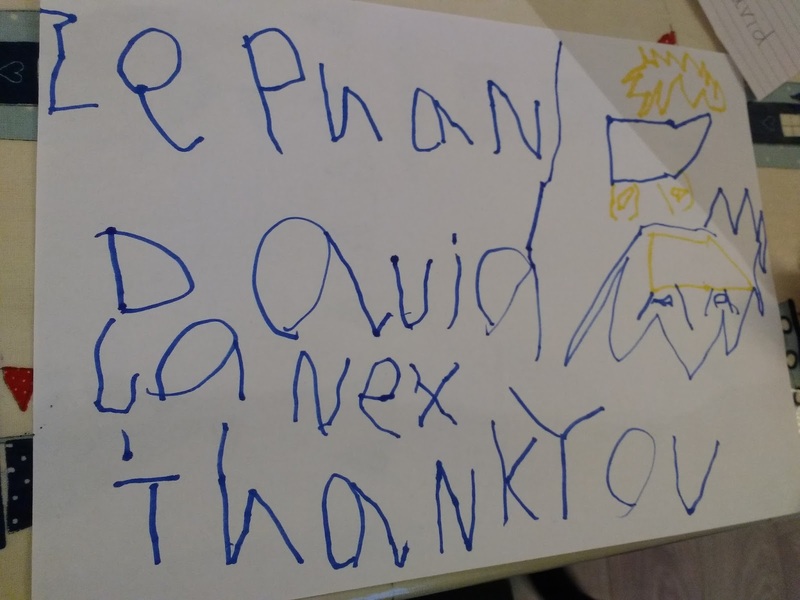 He asked for the words he wanted help with, and I wrote them down for him to copy. It was amazing to watch .... 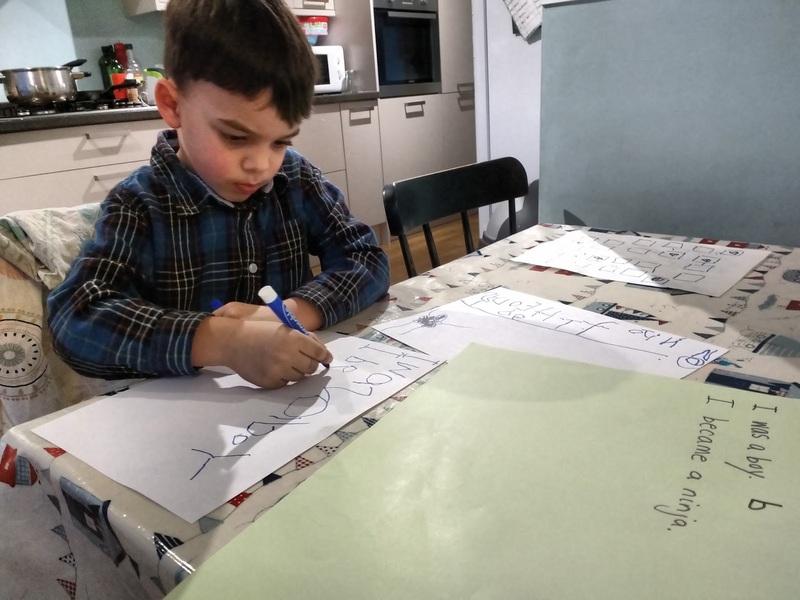 He was so motivated to write and with this real task at hand, writing has a real communicative purpose. It was wonderful to see the pleasure on his face. This week, he has moved on to writing his own story - Ninjas of the Outside! 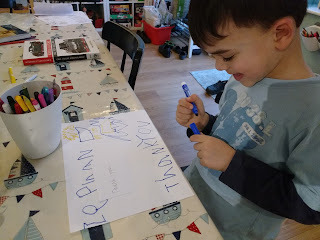 He asks me to write down the words for him to copy, and print is emerging .... large, wobbly letters which form words which run into each other ... but writing none the less. And again, his satisfaction is such that these treasured pages must be laminated and kept. It is amazing how the zigzags have evolved in just a month.